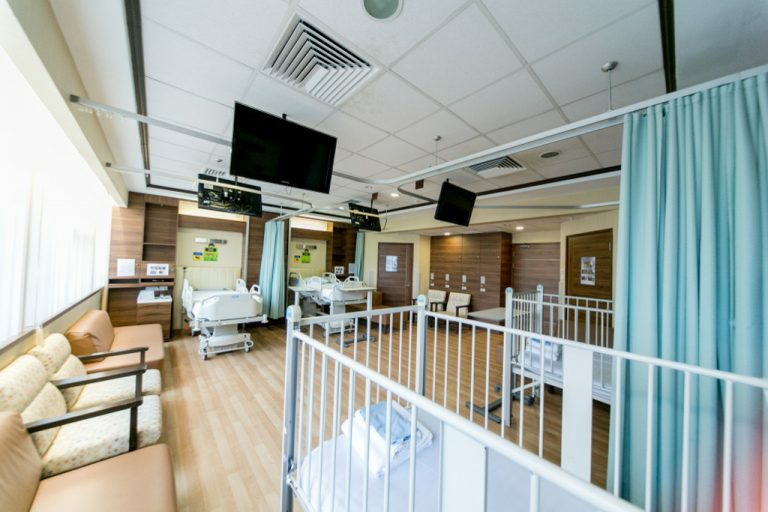 With both public hospitals and private healthcare options available to Singaporeans, which hospital should you choose for your child, should they – hopefully never – need to be admitted? 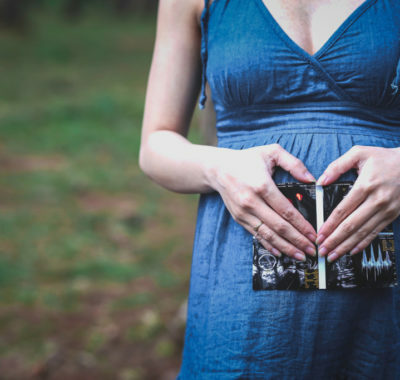 As not every hospital has specific facilities and personnel dedicated to the care and treatment of babies and children, we’ve narrowed down the list to those that do. There are pros and cons to each, of course. For example, waiting times at public hospitals tend to be longer, but private hospitals don’t offer subsidised charges. 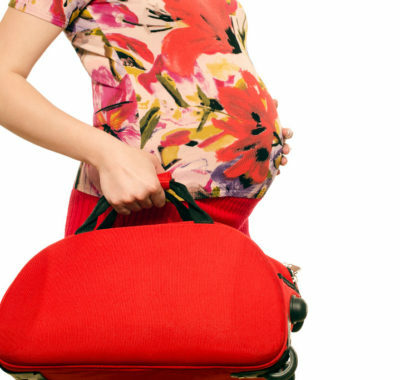 Still, in the case of emergencies, it’s best to head straight to the dedicated 24-hour Children’s Emergency departments at KK Women’s and Children’s Hospital or National University Hospital. Here is a rundown of fees (inclusive of GST) in eight hospitals1 in Singapore with dedicated children’s wards, across various room classes2. We’ve used two conditions that children are commonly admitted for to provide an example of estimated total hospital bill sizes3. These are Bronchiolitis (a respiratory condition that most commonly affects babies) and Gastroenteritis (diarrhoea; ‘stomach flu’ in layman’s terms). While we hope you never need all this information, it’s always good to be prepared. 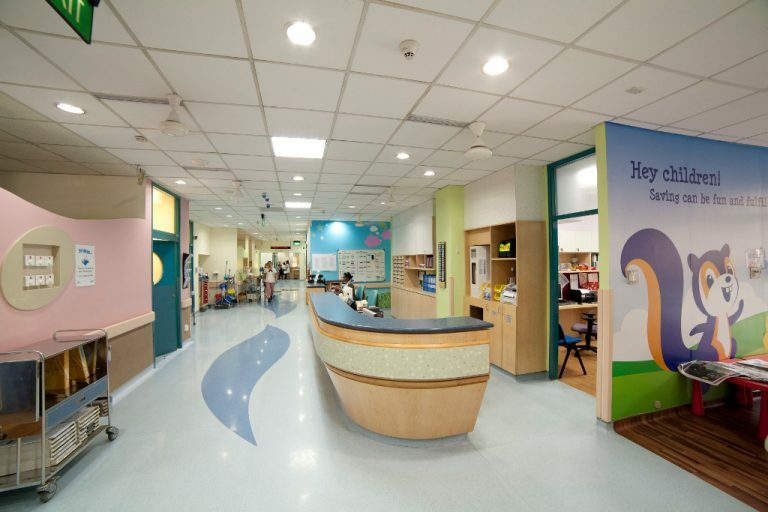 The ultimate children’s specialist hospital in Singapore, KKH needs little introduction, given that generations of Singaporeans have been born there. With walls decorated with paintings of the circus, zoo and underwater world, young patients are engaged and remain upbeat. Each ward has a play lounge. There are toys, games and books to keep them occupied, and even the occasional clowns to surprise them with balloons! 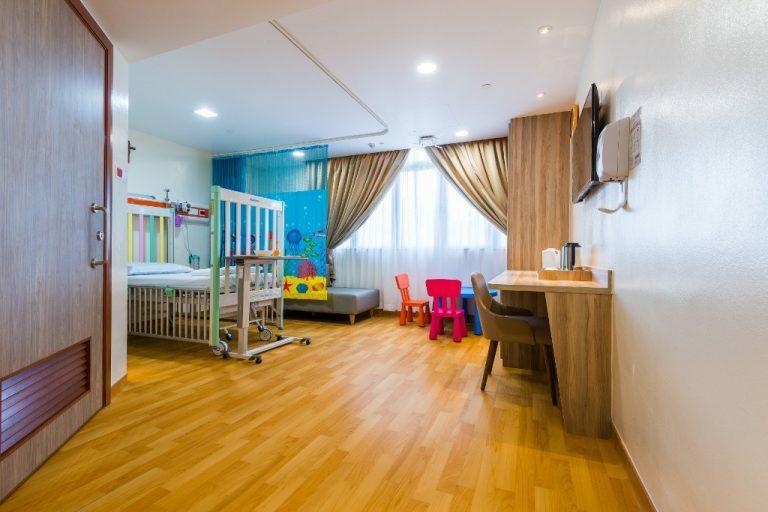 For fresh air, hop in a Little Tikes car and head to the children’s courtyard playground on Level 1, or go for a stroll in Kampong Java Park next door – do inform the ward nurse before taking your child out of the ward. Lodging for one parent at no extra charge. Single rooms are equipped with a sofa bed, while a foldable bed is offered across all other classes. $115 – This covers basic laboratory investigations, basic procedures, x-ray services and standard charges. To up the comfort level, bathrooms run water at a thermostat-controlled temperature. Also, medical equipment at KKH is very often specially made and scaled down to suit little patients. Club Rainbow provides free bedside tuition for primary school children who are warded for a prolonged duration or multiple times. This helps them catch up on lessons they are missing in school. The 24-hour Children’s Emergency provides initial evaluation, stabilisation and treatment to acutely ill or injured infants and children. Just like the rest of the Children’s Tower, it – and the staff – is decked out in kid-friendly garb. KKH is staffed with doctors and nurses who make the conscious choice to work with kids. They are specially trained in a wide range of general and specialist paediatric care for patients from infants to 16 years old. The paediatric arm of NUH is NUHkids, otherwise known as the Khoo Teck Puat-National University Children’s Medical Institute. 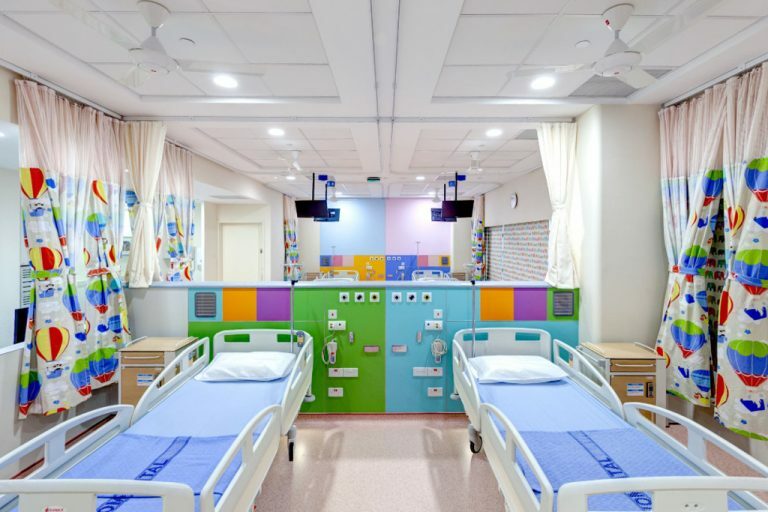 The children’s wards and procedure rooms are decorated with vibrant decals, and young patients get pyjamas with bright prints. 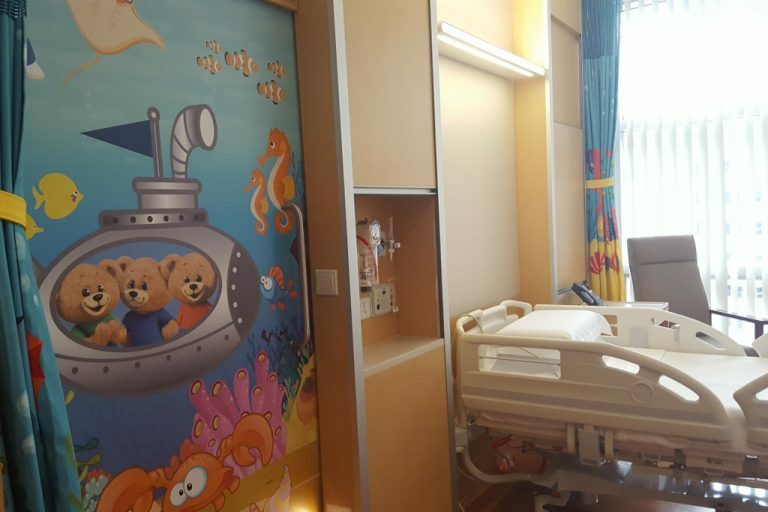 In addition, the multi-disciplinary ward has a dayroom with a Winnie the Pooh backdrop, children’s books and a TV screening cartoons. There’s also an outdoor playground next to the ward. $115 – This covers basic laboratory investigations, basic procedures, x-ray services and standard drugs. Kids who have to undergo an MRI get to don a spacesuit and embark on a ‘space adventure’ in the NUHkids Space Station, where they can watch a cartoon during the scan. It’s not just for fun; it helps reduce the need for sedatives in younger kids who might otherwise be anxious or fidgety and unable to remain still throughout the scan. Children who have to undergo surgery get to wait in a safari-themed room and watch cartoons while being prepped. It helps to reduce some of that pre-op anxiety. The 24-hour Children’s Emergency service is staffed by doctors and nurses who are specially trained to work with children. Child-friendly amenities include cheery decoration and murals, and interactive devices with fun games and educational apps for kids. At GEH, a diverse team of neonatal intensive care specialists and paediatricians care for children up to 16 years of age. There are both normal beds and cribs to cater to the different ages in the paediatric ward. 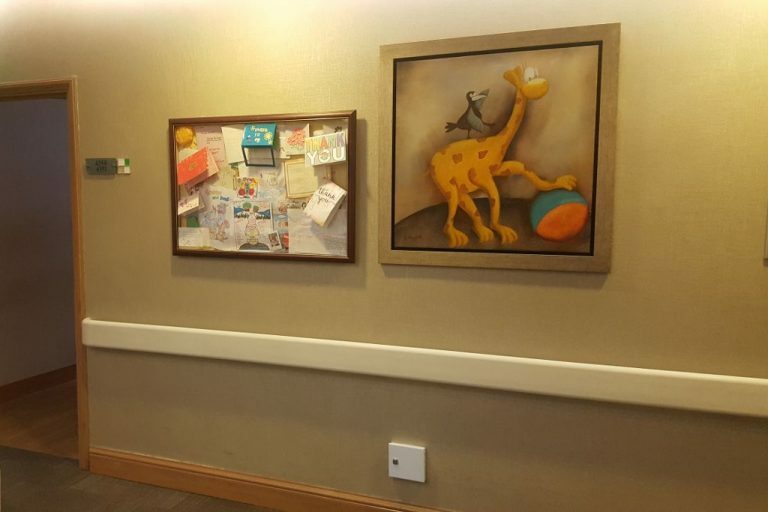 Cute animal picture frames adorn the corridors while ward number signs come to life with different animal faces. Children get special patient gowns with fun animal prints to add even more colour and cheer to their stay. Breastfeeding mums can make use of nursing rooms in the Parentcraft Centre. A rooftop garden on Level 5 offers patients and their families a change of scenery and fresh air. The St Gabriel Paediatric Ward in MAH is designed with an ‘Under the Sea’ theme, with deep blue water, bright and colourful coral reefs, plants and beautiful marine life. To further help younger patients feel less anxious in an unfamiliar environment, they are encouraged to wear their own clothes and decorate their rooms with cherished stuffed animals and even posters. 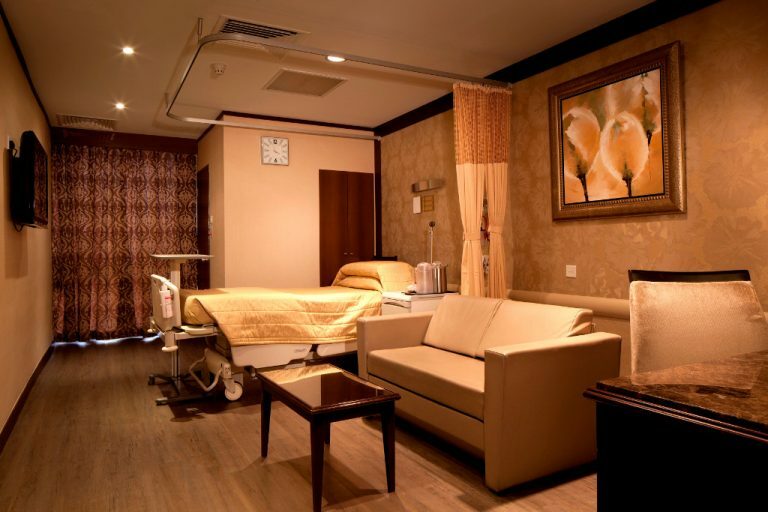 The ward also caters to parents with a built-in comfortable sleeping arrangement. 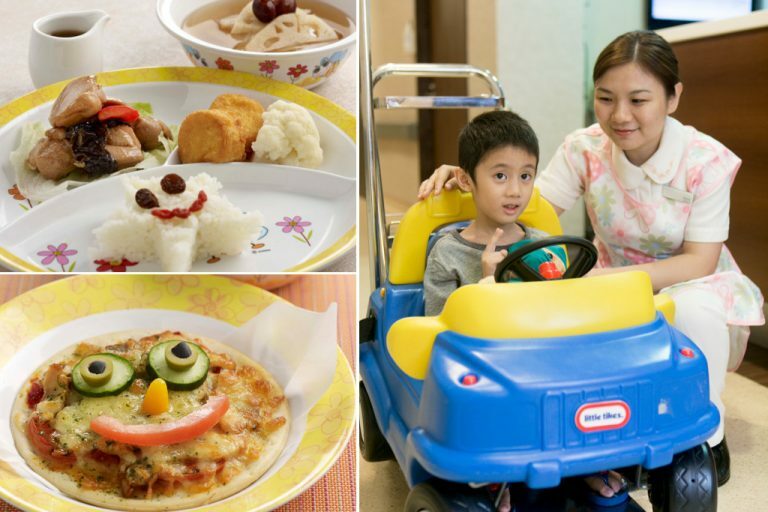 All paediatric rooms provide free lodging and meals for one adult companion. Single rooms allow two adult companions, with a daily charge of $80.25 for lodging and meals for the second companion. In a joint initiative by St Gabriel Paediatric Ward and Autism Resource Centre Singapore, Primary 6 students from Pathlight School create a doodle colouring book that is given to young patients. It comes with coloured pencils and a personal get-well message from the student. In return, the students get photos of patients receiving the books and the sense of achievement that comes with it. 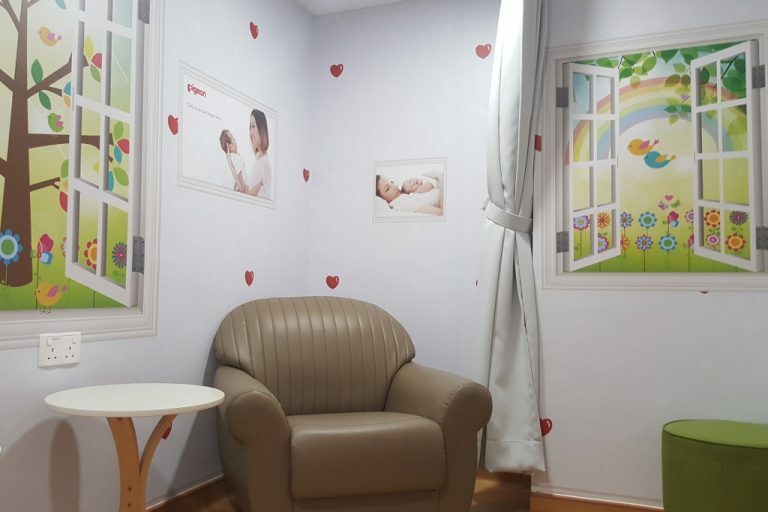 The Alvernia Parentcraft Centre is on the same level as the children’s ward, so in addition to the convenience and privacy of the breastfeeding room, lactating mums can also easily access Parentcraft services, should they need any assistance. Beyond medicine, an experienced team of Clinical Pastoral Care works together with the paediatric nurses to care for the children’s developmental, educational and emotional health. 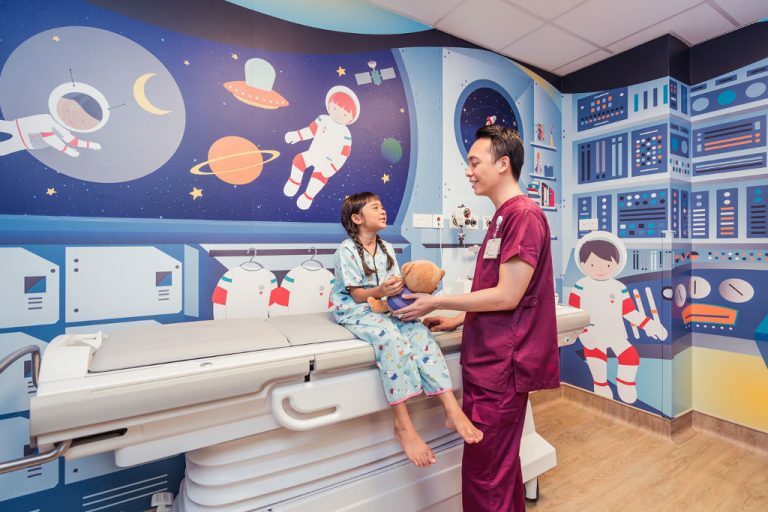 Located within the Orchard Road shopping belt, MEH uses the latest technology to offer medical treatments from neonatal intensive care to general paediatrics and behavioural medicine. 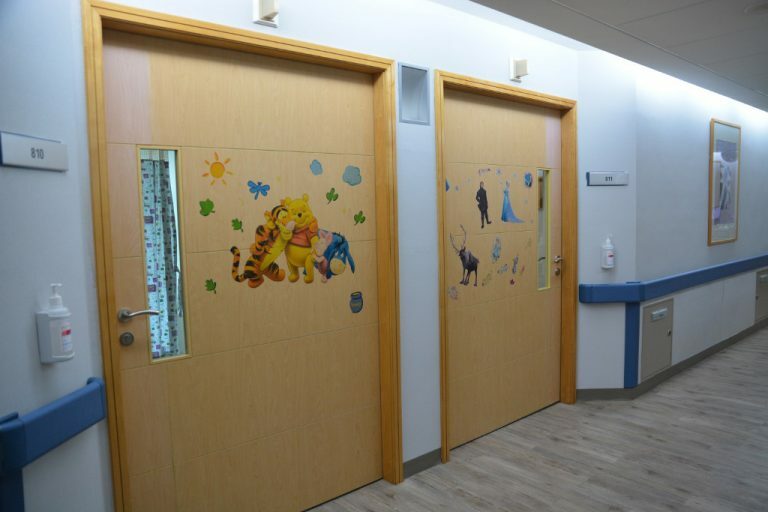 The children’s ward is a fun and welcoming place, with cartoon decals adorning the walls. Beyond nursing children back to health physically, there is also a focus on the mental and psychological development in the individual care of each child, setting a strong foundation for healthy growth. As much as possible, paediatric surgeons use minimally invasive laparoscopic procedures to treat conditions that require surgery, so that children face as little trauma and recovery time as possible. 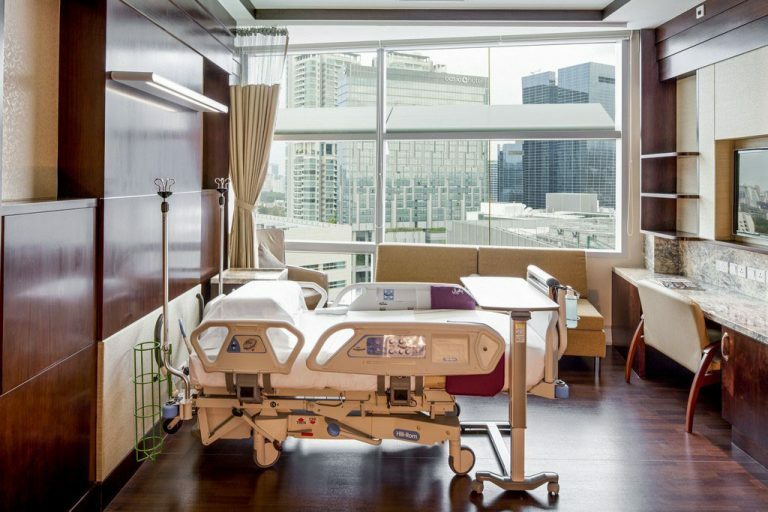 MNH is a fully single-bedded facility where patients can enjoy complete privacy and comfort throughout the entire recovery experience. The children’s ward is decked out in vibrant colours and cartoon animal pictures. This extends even to curtains, and nurses use them to quickly divert young patients’ attention from any discomfort during treatments. To keep children occupied, in-room entertainment includes storybooks and iPads with suitable activities. $110 inclusive of meals and lodging, excluding Class A room. Suites include daily meals for 1-3 caregivers. Although temperature-taking is an essential procedure several times daily, it can be disruptive and frustrating for parents, especially if their child is finally resting. MNH’s wireless temperature monitoring system automatically takes patients’ temperatures at intervals. Nurses can view the data from their counter and receive alerts when a patient has a fever. Safety is another key consideration, so all electrical sockets are fitted with a locked cover to prevent mishaps. The ward is also locked for security – verified caregivers receive a visitor access pass and other visitors have to go through the nurses before gaining access. The paediatric unit at PEH is dedicated to providing high quality medical, surgical and rehabilitative care for children from birth till 13 years of age. With corridors lined with children’s paintings, the soothing environment is designed to promote quick recovery. Welcoming interiors include chairs and couches for parents, who are encouraged to stay by their child’s side to comfort and support them throughout their stay. 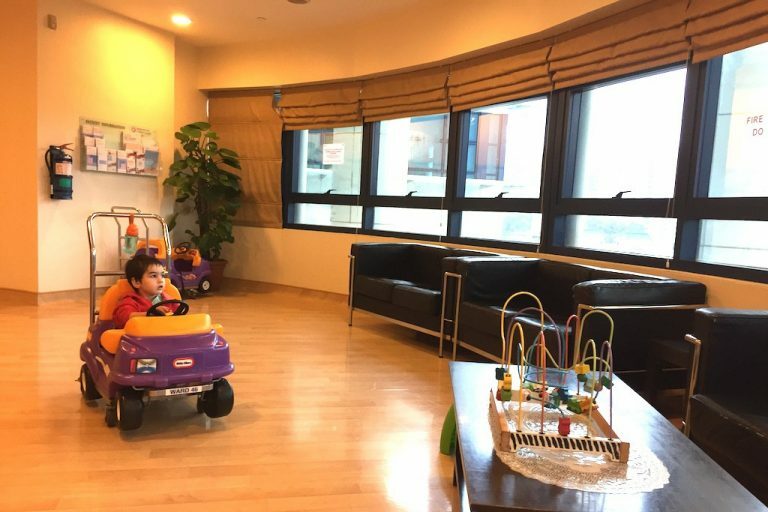 The ward provides car strollers that you can push your child around in, which never fails to put a smile on children’s faces. It’s also handy for you to take them out of the ward for a breather. The tasty Halal-certified paediatric menu is designed to provide nutrition from fresh ingredients. A dedicated culinary team puts extra effort into the presentation, so that meals appeal to the little ones visually as well. 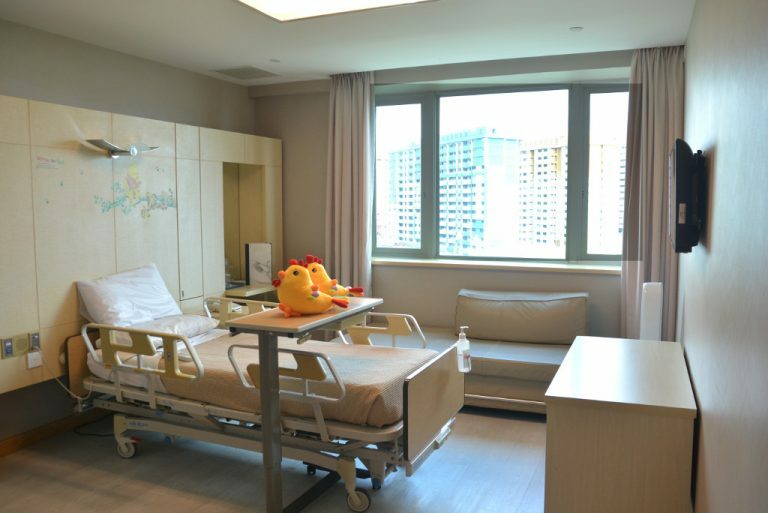 The paediatric ward in RH comprises 15 single rooms so that young patients can focus on recovery in complete privacy. Each is equipped with baby cots or children’s beds, with a sofa bed for parents, plus an attached bathroom. With cartoon murals on the walls, the rooms exude a cheerful and cosy ambience. For a rejuvenating break, head to the hospital’s garden, which is located next to the paediatric ward. A new extension is in the works, and once operational, will include a children’s playground. 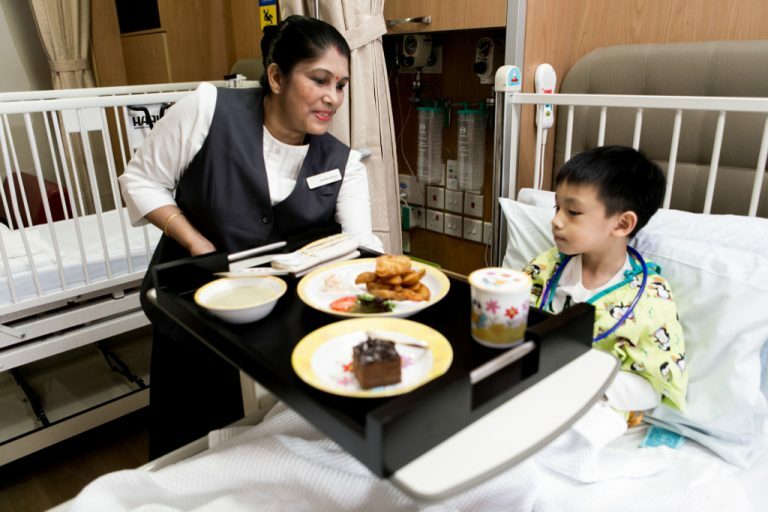 Paediatric rooms come with complimentary sofa bed and meals for one parent. A roller bed can be added for a second companion, with a daily charge of $104.86 for lodging and meals for the second companion. Healthy kids meals are designed for young patients, while parents can choose their meals similar to a hotel’s in-room dining menu. Additional ‘room service’ meals can be ordered at a charge throughout the day. RH operates on the Institutional Group Practice Model, the same one adopted by internationally renowned medical institutions such as the Mayo Clinic. This means that if your child was born in RH or has visited any of their clinics, their electronic medical records will be accessible by the attending paediatrician, ensuring holistic care and the most ideal clinical outcome. Families can also travel or relocate to 13 cities with peace of mind as Raffles Medical Group also operates facilities in countries from Vietnam to Japan, and is appointed the medical provider for major gateway airports in Singapore and Hong Kong.